We'd be missing out if there was a fall season without apples. It seems as though everyone is using apples in both sweet and savory dishes these days. I'm jumping on the apple band wagon and made a popular dessert, Apple Crisp. 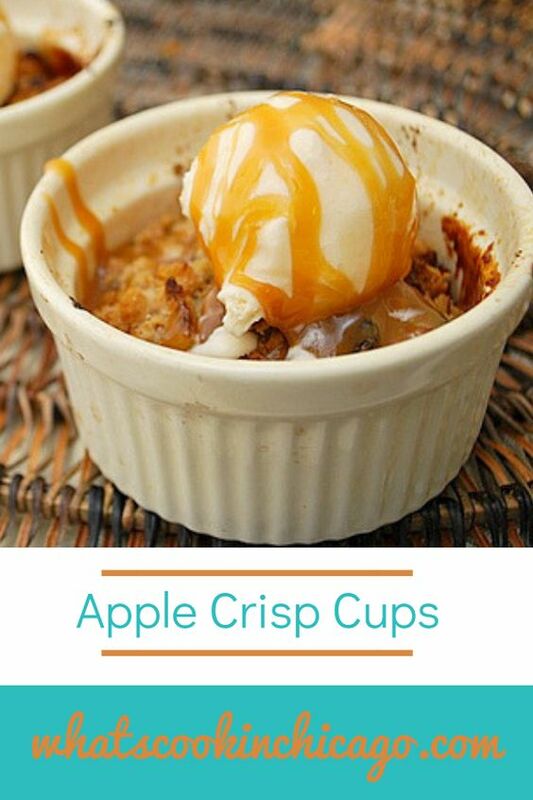 This recipe is loaded with apple flavor not just from the apples used but also apple cider. Read on to see how! This recipe uses both apples and apple cider to get great flavor in every bite. Apple cider is reduced down to intensify the apple flavor. It also takes chopped apples tossed in cinnamon sugar and are gently cooked in butter. The apples are then tossed with the apple cider reduction, placed in ramekins and baked with a crumbly, sweet topping of sugar, oats, flour, butter and chopped pecans. I prepared the recipe as individual crisps but you can make everything in one skillet, which is what the original recipe was written for. To make it as a single skillet dessert, prepare as written but omit the step of placing the apples in ramekins. Sprinkle the topping over the apples after cooking in the skillet and bake. 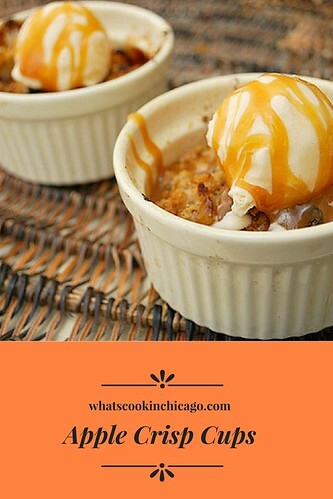 Either way you decide to make this Apple Crisp, don't forget to top with vanilla ice cream and drizzle with caramel topping for a decadent dessert! Preheat oven to 450 degrees. Grease 6 ramekins with cooking spray and set aside. Prep the apples by peeling, coring, halving each apple. Cut each half into 1/2 inch thick wedges. Combine flour, pecans, oats, brown sugar, granulated sugar, cinnamon, and salt in medium bowl. Stir in butter until mixture is thoroughly moistened and crumbly. Set aside while preparing fruit filling. Toss apples, granulated sugar, and cinnamon together in large bowl; set aside. Bring cider to simmer in 12-inch nonstick skillet over medium heat; cook until reduced to ½ cup, about 5 minutes. Transfer reduced cider to bowl or liquid measuring cup; stir in lemon juice and set aside. Heat butter in now-empty skillet over medium heat. When foaming subsides, add apple mixture and cook, stirring frequently, until apples begin to soften and become translucent, 12 to 14 minutes. (Do not fully cook apples.) Remove pan from heat and gently stir in cider mixture until apples are coated. Divide the apple mixture evenly among each prepared ramekin. Sprinkle topping evenly over fruit, breaking up any large chunks. Place ramekins on a baking sheet and bake until fruit is tender and topping is deep golden brown, 15 to 20 minutes. Cool on wire rack until warm, at least 15 minutes. 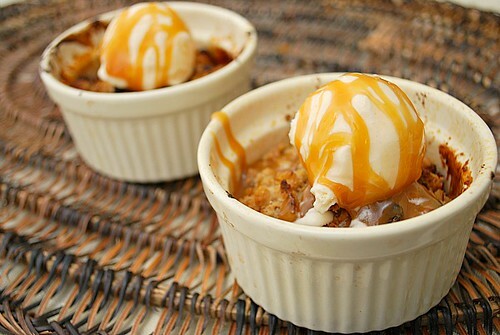 Serve with vanilla ice cream and garnish with caramel sauce. These look delicious! I love all apple related things--I can’t wait to try these! Too cute! Those look so yummy! Ok, those just look sinful! I can't think of any other dessert I would enjoy more than a warm apple crips with creamy vanilla fosting and sweet caramel sauce. I can almost taste it now!